A lifelong Liverpool fan has received an incredible birthday surprise from Jurgen Klopp ahead of his 104th birthday. 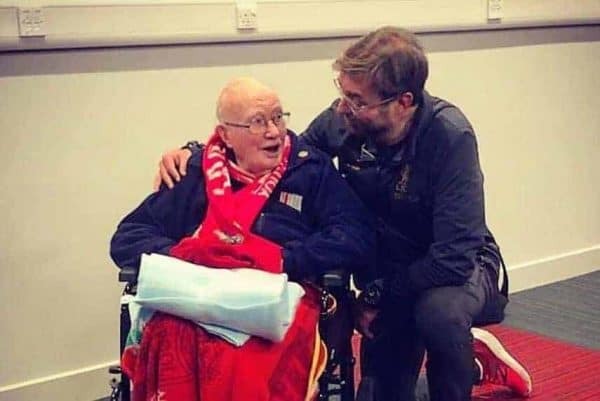 Bernard Sheridan has been a Liverpool fan since 1923, and soon to turn 104 he received a special surprise from the club and a personalised message from Klopp. To show appreciation for his 96 years of support, the club’s fan experience team made a personal visit to Bernard at his home at RMBI Home the Tithebarn, in Great Crosby. He was presented with a birthday cake, a personalised ‘Bernard 104’ shirt, a signed flag, a personal letter from the manager and tickets to the Reds’ game against Crystal Palace to commemorate his forthcoming birthday on January 25. Klopp’s message to Bernard said: “Dear Bernard, I would like to personally wish you a very happy 104th birthday!!! “I hope you enjoy celebrating with your family and friends. Thank you for your continued support of Liverpool Football Club. Bernard was eight years old when his uncle started taking him to games from their home in Wavertree, where one week it would be to see Everton and the next Liverpool. But it was not long after where his love affair with the Reds blossomed, and he has been an avid supporter ever since. And one of his fondest memories as a Red was being at Anfield with his young family for Liverpool’s famous cup victory over Wolves in 1952.
.@LFC super fan Bernard, a resident from RMBI Home The Tithebarn is to celebrate his 104th birthday by going to a match. He was delighted to receive a ‘Bernard 104’ shirt and a letter from Jürgen Klopp. Happy 104th birthday to Bernard! ? Bernard, who has seven grandchildren and 14 great-grandchildren, attended Saturday’s dramatic 4-3 win alongside his sons, one of which had travelled from Canada for the occasion. The club guest watched from the side as Klopp delivered his post-match press conference, after which, Klopp saw Bernard and despite having met earlier went out of his way again with the boss asking for a photo. 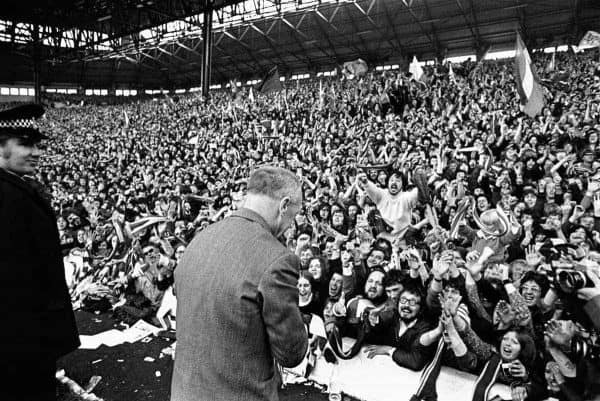 Happy 104th birthday, Bernard – You’ll Never Walk Alone!